A few weeks ago, our Chief Strategy Officer, JT Bricker, outlined our framework for customer marketing. Then, I expanded on the Customer Lifecycle process (the second column from left in blue below). We aim to make things easy to follow and thus, in this next piece, I’m taking on the next portion of our Customer Marketing sub-framework in process: Customer Scoring. Or Customer Churn Scoring. Or Upsell Scoring. Well … we’ll get into all of that below. Before we dig into the process considerations for Customer Scoring, take a moment to review the sub-framework below. Before you can tackle scoring, you’ll need to shore up everything in the Strategy column and you’ll also want to understand the lifecycle. Sometimes organizations will attempt to work through both lifecycle and scoring together, but I personally think you’re best served to finalize lifecycle before moving onto scoring. What is a Customer Scoring? 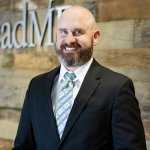 We all know what lead scoring means in a traditional demand gen funnel… it’s a mechanism by which marketing qualifies a lead for the purpose of only sending the most qualified records to sales for sales qualification. But how does lead scoring play a role in the customer marketing process? Once someone is a customer, lead scoring can take on more than one role. On one hand, lead scoring can be used to determine how ready someone is for an additional purchase… either a cross-sell or up-sell. On another hand, lead scoring can be used to determine how likely someone is to churn… in essence it can be set up as somewhat of a risk score or customer churn score. Look at the above lifecycle process. Can you imagine how scoring could fit into the “Adoption”, “Maturity” and “Advocacy” buckets? What sort of signals are those customer demonstrating that you could capture and score on, just in the same way you do for demand gen? Once you start thinking about it, it’s surprising how many obvious similarities are just sitting there waiting to be exposed and leveraged. Once someone passes a determined threshold, it’s an indicator, just like the engaged units of the demand gen side of the house, that sales should accept and explore the opportunity. The one caveat here is in the use case of a churn score, where your relationship managers or customer success team would be following up with those “units” who demonstrate a propensity to churn. Before you begin identifying data points or behaviors to score on, you must determine how your organization will use customer scoring. For example, do you need to determine when someone is ready to buy again, and therefore be the lever to move someone to “Sales Accepted” in the diagram above? Or, do you need to measure a customer’s level of adoption, maturity and advocacy? How will you define these goals? Well, you should already have them from your strategic KPIs. If you don’t, go read that strategy article and create them. Really. The goal you must reach will heavily impact the data points or behaviors you take into account in your customer scoring model. Once you determine the objective of your model, it’s time to start defining the data points and behaviors to include. No, it’s not lunch time… It’s time for more meetings. Sales. If these guys/gals are involved in the up-sell/cross-sell process, we’ll need their input on what makes for a qualified sales opportunity. They can also inform what types of products or features they attempt to bundle and the common pain points they hear in the sales process for these. We’ll want to align data points to these pain points eventually, so understanding how your product/service coincides with common customer issues is imperative. Customer Sales. If the up-sell/cross-sell of existing customers doesn’t fit into the responsibilities of either of the above roles, bring in these folks. Accounting. These folks can tell us if there are any data points that relate to an especially unhappy customer. This team can tell us about late payments, disputes, etc. that may be used to determine if someone is at-risk. Customer Support. Generally, this division is separate from customer success. Support, like accounting, is an area where customers will either be overjoyed with their experiences or absolutely hate it. Keep in mind, when your customer is accessing support, they are extremely vulnerable and likely in a state of extreme to mild panic. These folks can again provide data points or behaviors that indicate someone that is thrilled with the product or very dissatisfied. You’ll need a deep understanding of how their support data is structured. Which data points do we have that indicate a positive experience? Which data points do we have that indicate a negative experience? Can we measure actual engagement with the product? NOTE: If you have an app where you can’t measure engagement, that is not good. Please look into Gainsight, which is the market leader of in-app reporting and analytics. They are also huge proponents of customer marketing and success functions in organizations. What are the demographic red flags that indicate churn? Perhaps losing a key contact? Which behaviors indicate a positive experience? Which behaviors indicate a negative experience? Does the absence of behavior indicate anything… positive or negative? Which behaviors indicate an immediate opportunity (auto-qualifiers)? Can we use usage data in either demographic or behavior scoring? How much value should we give to the various inputs? The above represents an example of customer scoring behaviors based on product access, product usage, and expressing interest in other products. It also represents an example of creating a “risk score” that indicates a person’s churn risk, using a lack of behavior as the trigger. We created this after a series of three (3) 1-hr meetings with our client. After you define all of the inputs and the scoring values, it’s time to leverage technology to operationalize it. In order to build this out in a way that is automated and can be adjusted along the way, we leverage a marketing automation tool such as Marketo. Again, since I am personally a Marketo expert, and that is the tool the majority of our clients use, I’m going to focus on how to build this system in Marketo. Here are the step-by-step instructions for taking your customer lead scoring model from an Excel to Marketo. Before we get started though, we need to make a very key decision. Is our customer lead scoring going to be a part of our regular lead scoring program? Or, do we want to separate it out into its own dedicated lead scoring program? Either way, we’ll need to determine exactly what the trigger is that qualifies someone to trigger a sales or customer success alert (hint: the trigger should be related to the stages you created in your customer lifecycle). LeadMD recommends a whole new program, with new scoring fields. This will help you immensely when you report on your original lead scoring program (demand gen) and your customer scoring program (customer marketing). Therefore, below we detail the process under the assumption you’re following our best practices. These fields need to be created in SFDC first, on the Contact object as number types. Ensure the Marketo Sync User has visibility to these fields. This will then cause them to sync down to Marketo. 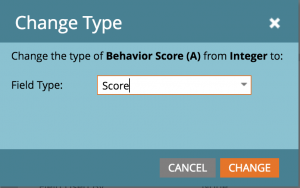 An important step here is to ensure you go into Marketo’s admin section and adjust the fields from integer to “Score”. Once you’ve got your new fields and your new program, it’s time to build out your scoring campaigns. Your worksheet should guide how you build your campaigns. Go, line by line, for each of the inputs, and adjust the campaigns that came over in the clone. Make sure you use scoring tokens in your program to set the actual scoring values. If you don’t, you’re going to have a really rough time updating the scoring values in the future. Trust us, on this one… you’ll thank us later. Here’s where this one can get tricky. If you’re using product usage data, or behaviors that exist outside of Marketo, you may need to create some Custom Activities before you can build all of your campaigns. As an example, when we created the above model for one of our clients, we had to build Custom Activities to track the product usage campaigns. For more on creating Custom Activities, click here. Alright!! Your campaigns are all built out and ready to rock. Let’s launch this thing!! Yeah, just the Lifecycle, we can’t just launch it. We need to make sure that things are built right. So, we’re going to go through a similar QA process that we did for the Lifecycle. Pro Tip: Create a User Acceptance Testing (UAT) document before operationalizing. We already told you the “why” for this in the Lifecycle article. But, again, if you simply test scenarios, it’s much more challenging to deduce what’s broken, because the outcome you receive somehow will manage to be what you expected, if you don’t keep yourself honest. And again, we have a template available for this here. Just like the Lifecycle, we first have to put some “training wheels” on your new lead scoring program. By “training wheels”, I mean you add a filter for “Email Address = yourname@yourcompany.com”. Then, when you create test records, only your tests will trigger your new campaigns. 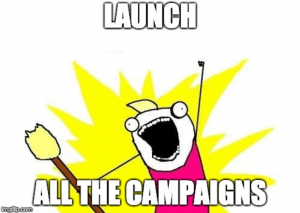 After activation, use your handy UAT document to meticulously review how campaigns react. Are the scores accumulating the way they should? Sweet! Is anyone getting a negative score? Bummer… that’s not good. Are your Custom Activities firing correctly? Very nice… those can be tricky. Here’s your chance to fix anything that went wrong during QA. Look, it happens… nobody ever builds these types of complex systems on their first try. But, that’s why we QA and test before it has a chance to negatively impact a real person in your database. So, let’s address those now. Launching a customer scoring program isn’t as big of a deal and doesn’t have as big of a change management process as the Lifecycle. But we should still have a launch plan, because this is going to impact people. Here is where we create that launch and communication plan. We work with the teams that we worked with in the initial stages to communicate with them where everything landed, what the process looks like, and how it impacts them and the people their teams. We need to train these folks on what customer scoring means, how they use it, and how it’s going to affect them. The day prior to our official launch, we want to activate all of the campaigns and batch people for their current demographic data points. In order to activate the trigger campaigns, all we need to do is to remove our “training wheels”. Once those are gone, those campaigns are up and running. Next, we take the demographic campaigns and run batch campaigns against those, to give people their appropriate score based on their demographic profile. Once that’s done, everyone has the score they should have. Run a few quick person reports, sorted by scores, to ensure nothing went nuts during this process. The distribution should make sense. You shouldn’t have three people at 1,000, forty in the 20s and a bunch of negative scores. Sound familiar? Yeah, we did this in the Lifecycle process too. This one works a bit differently though. We want to work with all of the “boots on the ground” within the teams we involved at the get-go. We want to give them specific things to look for that indicate that lead scoring may not be working properly. Hint… this should be factored in to your launch plan. Create a process for them to alert you when they see something off. When they alert you to an issue—and they will—respond quickly and openly. We want to continue to involve these folks, as they are going to help us optimize in the future. One of LeadMD’s core values is to consistently improve. A lot of our clients think that once a lead scoring model/program is created, you’re done. But, you’re not. A lead scoring model/program—whether specific to leads or customers—should evolve and change with your business over time. At this point, we start the process of continual monitoring and optimization of your new customer lead scoring model. As I mentioned above, we’re not done yet. As a matter of fact, lead scoring is never truly “done”. It’s always evolving and changing. Expect to monitor your new customer lead scoring model on a weekly basis for the first month. Look for people scoring too frequently in some campaigns. Or not scoring at all in other campaigns. Look for people with a negative lead score (that’s a negative, Ghost Rider… nobody should ever have a negative). You can do this in whatever system you choose to operationalize within. Again, if you’re a Marketo user, I can help you get started here. My favorite report type for reporting on your lead scoring program is a People Performance report. What makes this report type so good to use is its flexibility. It gives you an opportunity to group records by various data points (my personal favorite for a customer lead scoring model would be a date stamp for when the person became a customer). It also gives you the ability to add custom columns, which are basically smart lists. In the example below, the custom columns (the blue columns after “Total People”) are aligned to membership in the various lead scoring campaigns that score based on various product usage actions. 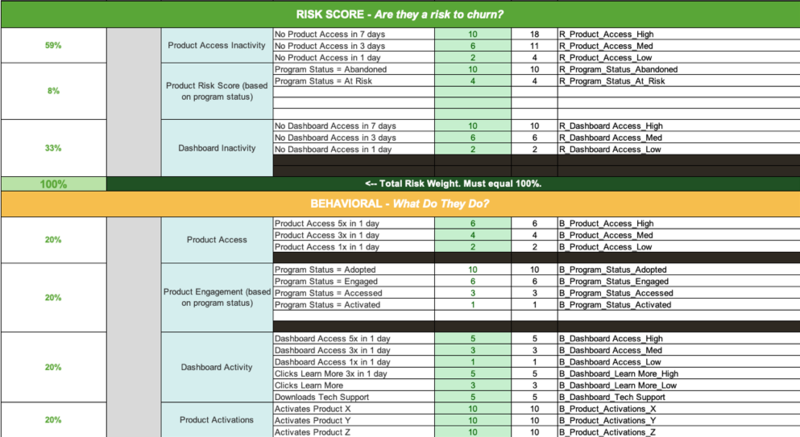 This type of report gives you a ton of data to use to evaluate how many people are scoring based on various actions… which can give you a high-level overview of your lead scoring model’s health. With these types of reports, you’re able do some analysis around which scoring behaviors are predictors for various behaviors… kind of like the below slide. Executives always want to know what the ROI of a project is. I mean, you already had this conversation with your e-staff about the customer marketing lifecycle, right? This is no different. Your executives are going to want to know what the ROI is of customer lead scoring. Again, we want to set expectations from the start. At the very least, you should set the expectation that you need the number of days on average upsell/cross-sell opportunities take to close before you’ll have any usable data around the effectiveness of your lead scoring model. If this sounds familiar, it should. It’s exactly the same time frame as your customer lifecycle. And it should be, since they work hand-in-hand. Hooray! 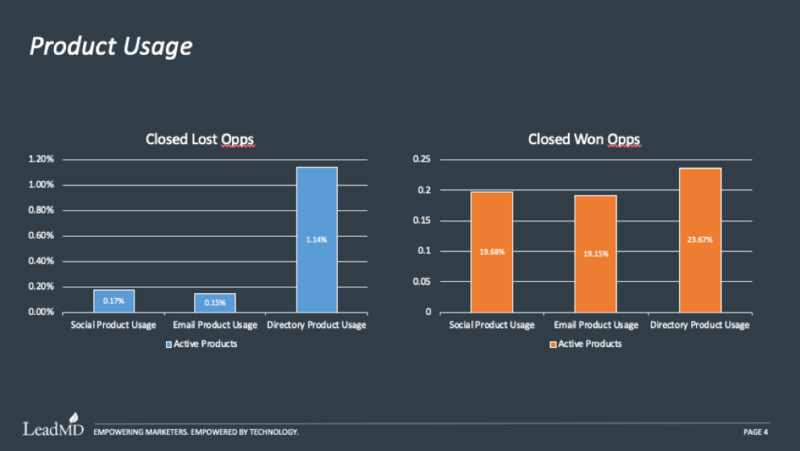 You’re now the proud owner of a fully operational Customer Marketing Lead Scoring model. This new model allows you to score people based on various criteria, and depending on the criteria you select, surface at risk accounts/customers or surface accounts/customers that are ripe for another opportunity. If you have a customer that has had a number of negative experiences throughout onboarding, you should be able to surface that person for additional touches from Customer Success, based on lead scoring. Or, if you have a customer that has been expressing online interest in another product, or upgrading their existing product, you should be able to get this person over to sales quickly. Either way you slice it, customer lead scoring can help you directly impact revenue… either from reducing churn or increasing the share of wallet of your existing customers. Lastly, I can’t express enough the importance of iterating on your customer lead scoring model. You should constantly be following the discover, build, report and optimize process to continue to improve and build upon your existing model. Next up: routing and conversion and sales process alignment.